Instability and uncertainty of the business environment, fluctuations in the volumes of freight and passenger transportations, as well as ongoing structural changes within Russian Railways, JSC require that the scientifically based approaches should be developed to ensure the effective management of staff expertise. The competency-based approach to human resources management is considered to be the most promising one at the present stage of economic development and human resource management. A sustainable competitive advantage can be obtained due to the transition from managing functional subsystems and individual business processes to the management style on the basis of competency-based approach. One of the main issues at the present stage of market economy innovation development is related to strengthening cooperation between science and industry. The economic system puts forward new requirements to the content of the level of competencies to be possessed by specialists entering the world economic space. This is directly related to the need to modernize higher education and to find the relevant mechanism for staff training and transition to a new level of cooperation between enterprises and educational institutions. The modernization process makes clear the fact that changes in the education system form a basis for the future economic and social development of Russia. 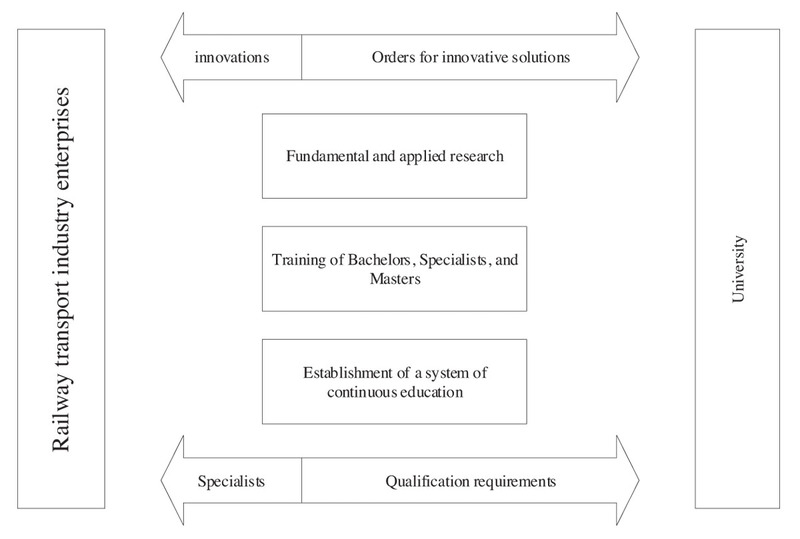 In particular, the modernization process implies the following development areas in the sphere of vocational training: creation of an effective system of supplementary vocational training; certification of syllabi in the sphere of management and economics; establishment of closer links between educational institutions and commercial enterprises; more active involvement of employers and other social partners in the educational processes; and strengthening of the research base for higher educational institutions. The experience of European countries, and Germany in particular, shows how much importance the EEC gives to the development of science. The budget of the Federal Ministry of Education and Research (Bundesministerium für Bildung und Forschung, BMBF) will increase by 1.2 billion Euros in 2016, amounting to 15.3 billion Euros . This accounts for three percent of the total federal budget. By 2017, the budget will increase by 25 percent more. This means that the federal government will invest more than 17 billion Euros in education and research. It should be noted that 12 years ago the volume of such investments amounted to 7 billion Euros. The budgeted expenditures for education and research is «an expression of modern holistic innovation policy, and thus, we have a chance to win the future», taking into account changes in the emerging markets, says Johanna Wanka, the Federal Minister for Education and Research. It is assumed that the «knowledge transfer» should be maximized and widely distributed for the benefit of economy and society . The interaction of three interested parties – state, employers, and system of education – is an integral part of any system of developing vocational education and training (Vocational Education and Training, VET). The degree of the employers’ involvement in the functioning of the vocational education and training system in OECD countries is high enough. The employers’ participation is based on the mechanisms that are embedded into the system of education, which enables the coordination of interests of all participants of the process. It is important that the employers are either collectively or individually involved in the process of defining, implementing, and evaluating a list of competencies that are in demand in the labour market. In this regard, many OECD countries have developed national strategies for the development of competencies and are now at various stages of implementing those strategies. In 2011, the OECD prepared a «OECD Skills Strategy» Synthesis Report, which gives certain recommendations to the member countries . Promising social and economic trends and emerging technologies bring about significant transformations in the sphere of labour market needs for certain specialists. The labour market requires that the employees should possess professional and applied knowledge, competencies, mobility, skills in mastering new technologies, ability to know the information flows, ability for self-learning, and ability to search and to make use of information and other resources. The main university majors are focused on building a competency-based model of training, aimed at leading the needs of business community and state in general, and the needs of railway transport industry in particular. The existing challenges of resourcing the enterprises are shifting to the sphere of human resources, although not yet perceptibly, but quite consciously already. In this context, the enterprises of real sector of economy are interested in finding an effective model of interaction with the higher education system. building a system of built-in graduates’ training at all stages of their future career. Railway transport industry in Russia is a giant economic sector, on which the country’s economy depends. The process of reforming this industry is also aimed at solving one of the major issue related to human resources policy. Monographs written by scholars in the field of training personnel for the railway transport industry – V.L. Nesterov, S.V. Rachek, E.V. Revina, L.V. Gashkova and others – identify directions for staffing a strategy for sustainable development of the federal railway transport in the context of its reform. Issues related to theoretical and methodological and organizational foundations of staffing the industry were discussed. virtual absence of research funding in HR policy (0.12 percent of funds allocated to science). Consequently, the mechanism of HR policy implementation weakened. Moreover, the enterprises’ requests for university and technical school graduates declined unreasonably. High responsibility of the industry to the state requires that modern approaches should be developed to build the capacity of the workforce, which would be able to solve complex problems. The systematic comprehension of this issue can be achieved through a clear understanding of what kind of employee the industry enterprises need, and what should be the principles of selecting the curriculum content. 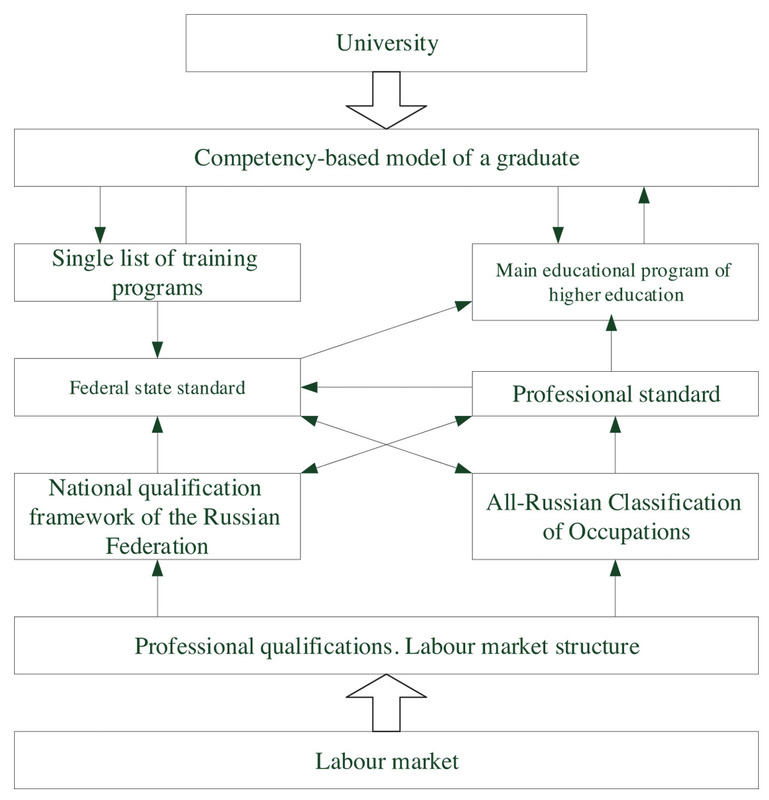 Thus, specifying the scheme in Figure 1, we can assume that the process of interaction between industry and a higher education institution in training, retraining and raising the level of vocational competencies of employees is the following (see Fig. 2). ability to correctly sort out social and production priorities. Thus, it can be seen that there is no complete integration in collaboration of industry enterprises and higher education institutions, and there is a discrepancy between training and retraining of specialists with the required list of competencies that are appropriate for their positions. Cooperation with universities, with the leading Russian educational institutions and other educational institutions established in the transport industry allowed to create a system of training, retraining and advanced training of staff aimed at their development. The main objective of the system of vocational t­raining of staff of all levels existing in the railway industry is, the one hand, to f­ill in the missing staff by training new specialists and re­training those that already have a certain profession or job, and on the other hand, to enhance the professionalism of employees of all levels – from top managers of transportation companies up to the staff of general professions. One of the main directions in vocational training of transportation industry workers is to consider the establishment of a complex four-level system of continuous vocational training of staff (see Fig. 3). The main factor in building the necessary competencies is a balanced education and vocational training policy. The government together with employers and educational institutions should continue developing and enhancing professional standards, and requirements to professions and positions, and should further synchronize them with the federal educational standards. 1. URL: http://www.bundesregierung.de/Content/DE/Artikel/ 2014/09/2014-09-11-haushalt-bmbf-2015.html (date of access December 6, 2015). 2. Towards an OECD Skills Strategy. The OECD Skills Strategy. Paris: OECD, 2011. 3. URL: http://europa.eu/legislation_summaries/education_training_ youth/vocational_training/ef0018_en.htm(date of access December 6, 2015). 4. 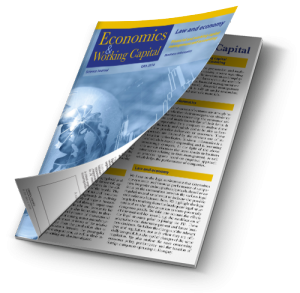 Kekkonen, A. L., Sigova S. V. Foreign Experience of Predicting Vocational Competencies Required in the Labour Market [Electronic Resource] URL: http://freeref.ru/wievjob.php?id=623171 (date of access December 6, 2015). 5. Gashkova L.V. Managing the Expertise of Staff at Railway Enterprises: thesis for a Candidate Degree in Economic Sciences: 08.00.05 / Ludmila V. Gashkova. – Ekaterinburg, 2017. – 165 p.